I’m back to cutting wood hand to mouth. It’s ok though. I had enough cut and split to get through January and February. Next year I plan on having more than enough for the entire wood-burning season by December 1st. After using the outdoor wood burner for two seasons, I wouldn’t recommend one for most people. It isn’t as simple as chucking in wood and forgetting about it. It takes some fiddling, and it’s always asking for more wood. Pictured is my tractor. I bought it last autumn. It’s a 1981 Deutz 7807. It has 78 horsepower, which is just enough for grinding feed, the most demanding horsepower job on my farm. I bought it from a dealer who sold it new. It has 4500 hours on it and I paid $8500 for it. I like it so far. This entry was posted on Sunday, March 4th, 2012 at 7:47 pm and is filed under Curious farmer. You can follow any responses to this entry through the RSS 2.0 feed. You can leave a response, or trackback from your own site. That’s a good looking tractor. And I learned what an outdoor wood burner is. Forgive a city-slicker question: How does a tractor grind feed? Yes, I presume too much. 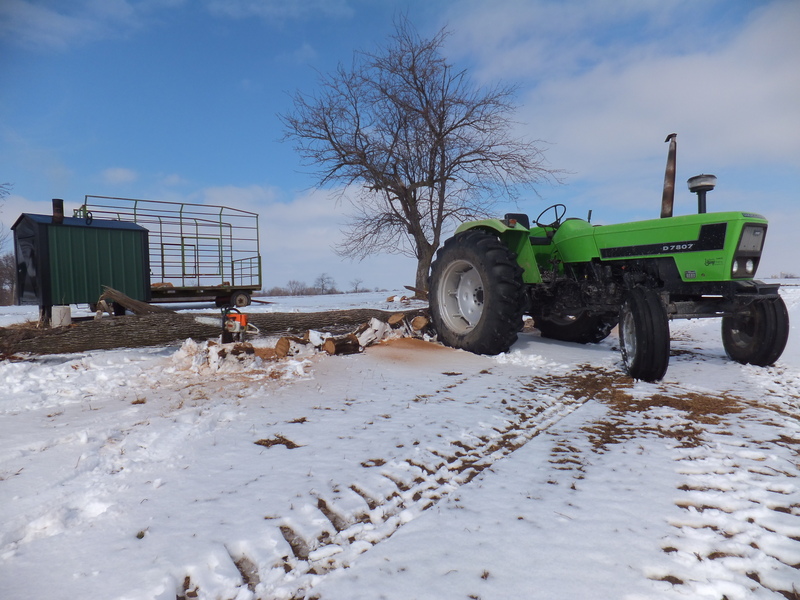 The tractor is hitched to the feed grinder and gives its power via the PTO or power take off. Thanks for the compliment on the tractor.